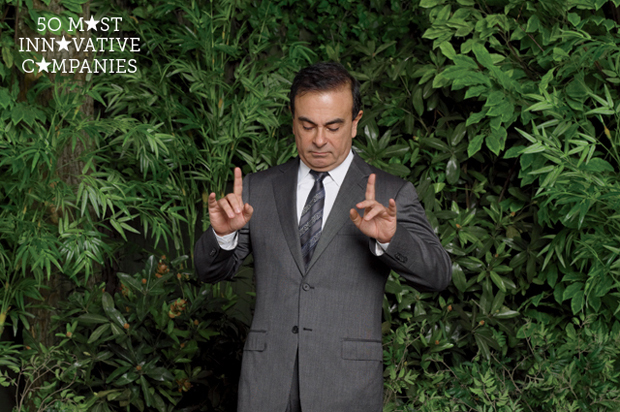 From Azul to Nissan, these companies are reshaping how we get from here to there. For creating the Leaf, the first mass-market, all-electric car. To make the switch from gas to electricity easier, Nissan is working with electric companies and cities, such as Houston, to build public charging networks. For converting bus riders into frequent fliers by introducing quick, convenient, and cheap flights in Brazil. The company, started by JetBlue founder David Neeleman, secured about 8% of the Brazilian market within two years of its first flight. And by the end of 2011, Neeleman plans to have the airline serving 50 Brazilian cities. For revolutionizing the way we travel within and between cities. IBM’s traffic-management software, for example, raises and lowers tolls depending on how many cars are on the road. For greening trains and planes with innovations such as Required Navigation Performance Software, which creates the most fuel-efficient path for a landing aircraft. It’s just one part of a GE green portfolio that generates more than $18 billion annually. For bringing the first large-scale bike-sharing system to the U.S. B-Cycle made its debut on Earth Day 2010, bringing 400 bikes to 40 docking stations in Denver. In just one month, more than 3,000 people had used the system. B-cycle now lets users check out bikes with credit cards and monitor real-time availability on iPhones. For launching a flexible, eco-friendly option in car sharing. Germany’s Daimler, the world’s second-largest maker of luxury cars, transformed car-sharing with Car2Go, a network of Smartcars that can be picked up and dropped off wherever drivers want, rather than in designated parking lots. For smart-parking and traffic-control technology. There were 8,255 Streetline parking sensors for a pilot program in San Francisco, which enabled the city to implement demand-responsive pricing for parking: the fewer the spaces, the higher the cost. Streetline has spread to seven cities, including New York and Los Angeles. The aim is to have 15% of all parking spots open at any given time. For its cutting-edge U.S. military drone planes. This year, Boeing’s going robotic, with new drone planes fighting in the wars Iraq and Afghanistan. The company estimates a $55 million market for these planes through 2018. For running the largest lithium-ion manufacturing plant in the U.S., paving the way for American electric cars. A123 Systems opened the factory last fall, just a year after the Massachusetts-based company issued a $317 million IPO, the largest of 2009. The plant leverages nanoscale assembly, letting the company make high-voltage, fast-charging batteries. For making the Urbee, a car manufactured by a 3-D printer. Because the Urbee was made using additive manufacturing (a.k.a. printing), manufacturers could eliminate most of the heavy tools and machinery of traditional auto assembly.